"One of the major questions in the field of study is, 'Why do some clouds produce high- and low-mass stars, while others form only low-mass stars?'" said team member Oliver Krause of the Max Planck Institute for Astronomy and the Steward Observatory in Tucson, Ariz. The conditions necessary to form high-mass stars are difficult to deduce, because the stellar monsters form so far away and because they remain shrouded behind curtains of dust. Only long wavelengths of infrared radiation can escape their obscuring cocoons and reveal the low-temperature dust cores that mark the sites of star formation. The research team collected this radiation using the ISO's ISOPHOT far-infrared camera. The astronomers used ISOPHOT's data to focus on two intensely cold and dense cores, each containing enough matter to form at least one massive star. The first core, at 16.5 degrees K (minus 256.5 degrees C) contains 75 times the mass of the Sun and shows signs of gravitational collapse. The second is around 12 degrees K (minus 261 degrees C) and contains 280 solar masses. The team now is studying the other potential sites. "This opens up a new era for the observations of the early details of high-mass star formation," Krause said. The team acquired the data as part of the ISOPHOT Serendipity Survey, or ISOSS, which allowed ISOPHOT to record data continuously even as it moved from one target object to the next. During the ISO's mission - which lasted for two and a half years during 1995-1998 - the spacecraft performed about 10,000 such repositioning maneuvers, or slews, as they called. Krause arranged for ISOPHOT to survey for infrared emissions at a wavelength of 170 micrometers. This is 310 times longer than optical radiation and reveals cold dust down to just 10 degrees Kelvin (minus 263 degrees Celsius). The survey data showing cold dust sites were compiled in a catalogue, and when the team analyzed the data they found 50 potential places of high-mass stellar birth. 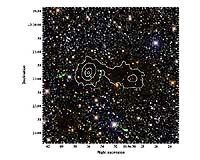 When they conducted follow-up observations using ground-based telescopes, they found that object ISOSS J18364-0221 comprised two cold dense cores that looked suspiciously like those associated with the birth of low-mass stars, but containing much more mass. Because ISO is no longer operational, ESA astronomers are participating in JAXA's Akari infrared mission (formerly ASTRO-F) to attempt to fill in the blanks in the ISOSS data by surveying the whole sky at six infrared wavebands. ESA next will pursue infrared astronomy with the Herschel Space Telescope, due to launch in 2008. The spacecraft will feature a 3.5 meter mirror and far-infrared detectors, intended to reveal the earliest phases of massive star birth in unprecedented detail. "When astronomers look billions of light years into space, all they can see are the bright, high-mass stars in very distant galaxies," Krause said. "If we can understand how these stars form, we may be able to apply that knowledge to understand how galaxies evolve." Try mixing caramel into vanilla ice cream and you will always end up with globs and swirls of caramel. Scientists are finding that galaxies may distribute themselves in similar ways throughout the universe and in places where there is lots of so-called dark matter.